Tesla has announced the full line of model S trim levels, prices and options which include three range-determining battery options, four trim levels and a price range from $49,900 for the basic model to $97,900 for the pick of the litter 2012 Tesla S Signature Performance model. The base model S battery choice is from three power levels of 40, 60 or 85 kWh, with corresponding range projections of 160, 230 and 300 miles respectively, at a continuous 55 mph. Obviously factors like speed, elevation gain and crosswinds affect the range of an electric vehicle just as they do a gasoline automobile. Those 2012 Tesla Model S battery choices come with corollary prices of $49,900, $59,900 and 69,900 on a premium sedan with seating for up to 5 adults and a pair of children with a 17-inch touchscreen display (larger than the monitor used to write this) 19-inch wheels, and surprising celerity for a vehicle slightly over 16 feet long. The 40 kWh model will sedately go from zero to 60 in 6.5 seconds, meaning any number of small gas-powered cars can still race around it. It can attain a top speed of 110 mph – certainly adequate anywhere this side of Cologne. The 60 kWh version will get from zero to 60 in a more respectable 5.9 seconds making it a strain for many of those little cars to outdo its performance. This trim level has a top speed of 120 mph. Something you might save for one of those I-can-see-for-miles, only-soul-in-sight occurrences in the deserts of the Southwest to verify. The 85 kWh battery model gets closer to the performance of some sports sedans cruising quietly from zero to 60 in 5.6 seconds, with a top attainable speed of 125 mph. A Performance grade of the 2012 Tesla Model S also has an 85kWh battery pack with a tweaked suspension, wheels and interior, plus the medicine for those with a need for speed, streaking from zero to 60 in 4.4 seconds, equaling some gas-guzzling muscle cars. The upgrades include a high performance drive inverter, exterior carbon fiber accents, Nappa leather with Alcantara detailing plus additional carbon fiber décor. It also features Active Air Suspension and Sport-tuned Traction Control along with performance wheels and tires. Interestingly, you can have any of the above models in 7 colors and three treatments, but if you want a red Model S at this level, you have to wait until 2013. Further, the base model is in production now with the 85 kWh models tooling up this summer. You’ll have to wait longest for the 60kWh version of the 2012 Tesla Model S, as it will not go into production until fall of this year. The 2012 Tesla Model S Signature trim level is the next step up in the Tesla corral. It also features the 85 kWh battery pack, a zero to 60 speed of 5.6 seconds, Active Air Suspension, exclusive white Nappa perforated leather upholstery, a range of 300 miles and you can get it in red at a price of $87,900. The very impressive 2012 Tesla S Signature Performance model uses the same battery, has the same upgrades as the S Performance grade and also runs zero to 60 in 4.4 seconds but has the highest top speed at 130 mph. All the above models have an 8-year warranty on the battery, with limited mileage caps only on the 40 and 60 kWh models of 100,000 and 125,000 miles respectively. The top two grades have unlimited mileage warranties on the battery. Options include an all-glass panoramic roof, 19-inch wheels with all-season tires or 21-inch wheels with high performance tires; Nappa leather 12-way adjustable seats; a Tech package that adds navigation, rearview camera, keyless entry, Xenon headlamps, LED foglights, a power liftgate, two backseat USB ports and Homelink; an audio upgrade to a 580 watt, 12 speaker Dolby ProLogic 7.1 system with storage for 3,000 tracks; rear facing kid seats, onboard charging systems, and a home charging system. Notably most of the options come at an added cost only in the base and in couple of cases the 60 kWh model, except the home charging unit, which is an extra $1,200 across the board. 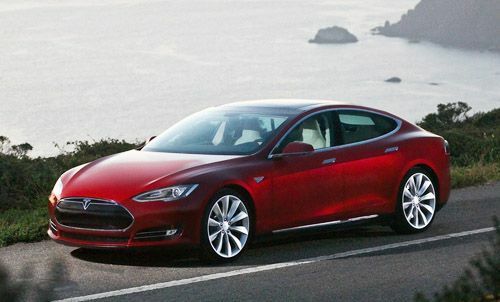 In closing, the 2012 Tesla Model S reaffirms the brand’s leadership in the realm of electric cars. What Toyota is to the hybrid, Tesla is to the EV. This is further confirmed by the fact both Toyota and Mercedes-Benz have contracted with Tesla to help them build full electric versions of their cars. Not everyone is charmed by the brand’s CEO, Elon Musk, but personalities aside; Tesla is a force to be reckoned with in the modern automotive market – one that will probably loom more important with the passage of time. I still haven't seen if it's possible to upgrade the car's battery pack to a higher one yet. Also, anyway to choose non-leather seats, which are normally heavier than regular fabric? Done With Model Y, Tesla Fans Move on to the Pickup Truck: What Will it Be Like?